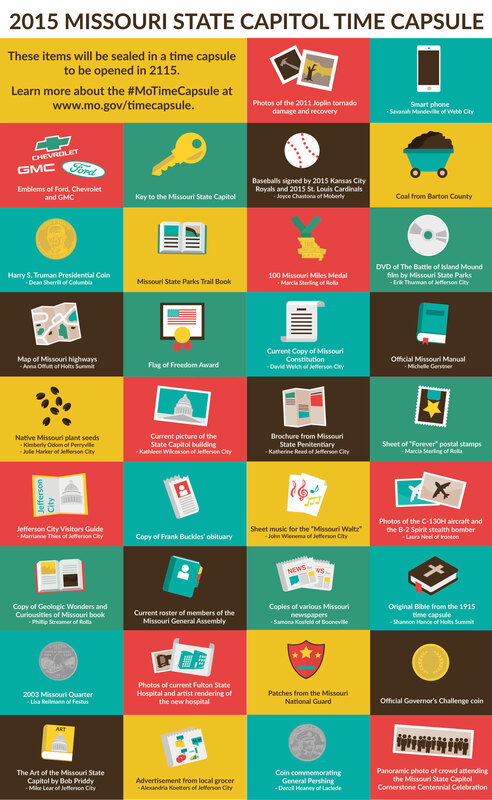 Thank you for submiting your nominations for items to include in the Missouri Time Capsule. The new time capsule was dedicated on Friday, July 3 at 1:00 p.m. during a ceremony on the south side of the Missouri State Capitol commemorating the 100-Year Anniversary of the Capitol Cornerstone. A list of the items placed in the Missouri Time Capsule, including the names of those who had nominations selected, is available here. What’s going in the #MoTimeCapsule? The 1915 Missouri Time Capsule, which was removed from the cornerstone of the Missouri State Capitol last week, was carefully opened on June 18, 2015. Video from the event is available for media use in high definition and standard definition formats. Photographs from the event are available for download as well.